There is always the potential for last minute changes to posted hours....don't hesitate to call before making a special trip. Since 1998, Carolina Mountain Sports has provided the finest equipment and accessories for fly fishing, backpacking and canoeing in North Carolina, southwest Virginia and eastern Tennesee. Our customers are hiking the Appalachian Trail and the backcountry of Pisgah National Forest; fishing premier trout streams like the Davidson, S. Holston and Watauga River; and canoeing and kayaking a variety of southeastern waterways. We’re a small shop with a full line of gear, and the service and experience to back it up. If we sell it, we’re using it and we’ll give you the benefit of our experience. If planning a fly fishing trip in North Carolina, Tennessee, Virginia or Georgia; considering backpacking in the Great Smokies or national forests of NC; or canoeing or kayaking the New River and waterways along the coast of Virginia, North Carolina or South Carolina, check out our web site or call/email with any questions. 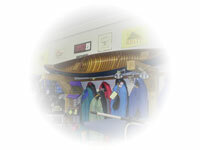 Better yet, stop by for a friendly visit at one of the most unique outdoor equipment stores in western North Carolina. In addition to clothing and gear, we have antiques, collectibles and Indian artifacts on display. We provide personalized, friendly service to assist customers in making the best choices when selecting fly rods, backpacks, and paddlesports gear for fly fishing, hiking, canoeing and kayaking in North Carolina and other areas. With the proliferation of chain stores and internet sales, we’re proud to offer the benefits of a specialty shop and sincerely appreciate our customers who value what we offer and support us. We recognize, everyone can’t come in to inspect gear or cast a fly rod and we’re happy to accept orders by phone or email.